We woke to another beautiful morning, does it never rain here? (hope I haven’t jinxed it). 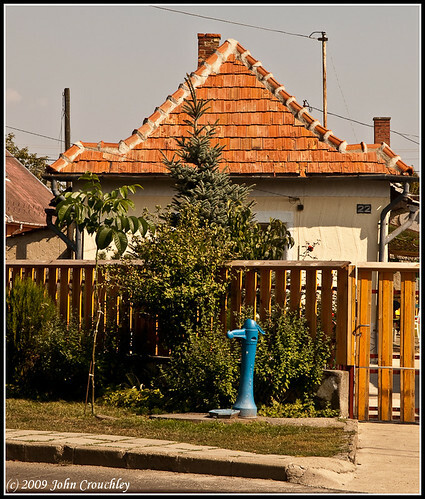 As we open the door to our little house you’re greeted with a very typical Hungarian view. 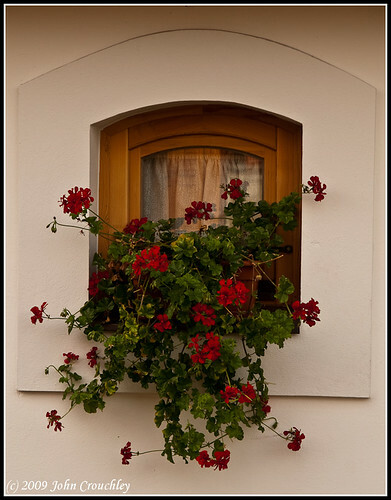 No wonder Maria loves geraniums. We set off to Mezökövesd to have another look at this painted Tulipános Láda (Tulip Chest). 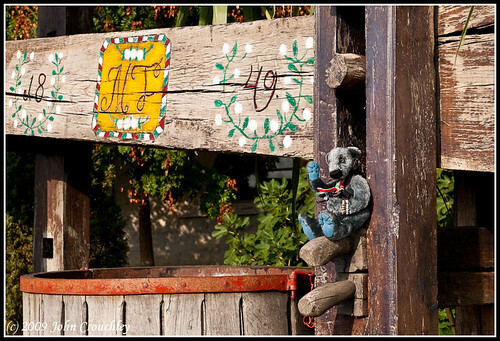 Mezökövesd is a town famous for it’s folk art, especially embroidery. A small area of the town has been maintained as it was for the last couple of hundred years and the houses turned into a combination of museums and studios. It is all very picturesque. John and Robert found a shady spot to sit while I went off with Maria and Claire. After a while I abandoned them and joined the boys, there is only so much I want to know about the finer points of needlework, weaving, spinning etc. Although the stuff about housekeeping in the old days was very interesting. Maria was particularly taken with the idea that the ranking female in the family (ie. the oldest) got the warmest cosiest spot to sleep, and the men slept in the stables and only came into the house for meals. Maria did ask how come they still had such large families, she got the answer ‘Haystacks’, which I don’t understand but she refuses to explain. 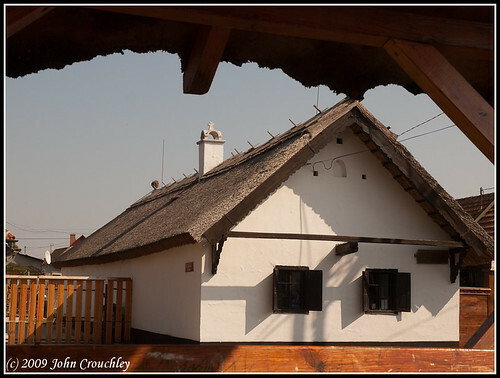 The furniture painter was in one of these houses and the Tulipános Láda was still much loved and John decided to buy. Maria also hankered after a piece of embroidery, but even she agreed it was too mush to buy right now. Didn’t stop her buying a smaller piece of embroidery and a Miska Kancso (a sort of Hungarian version of a Toby Jug), I hope there’s room in the car for me on the way back to England. 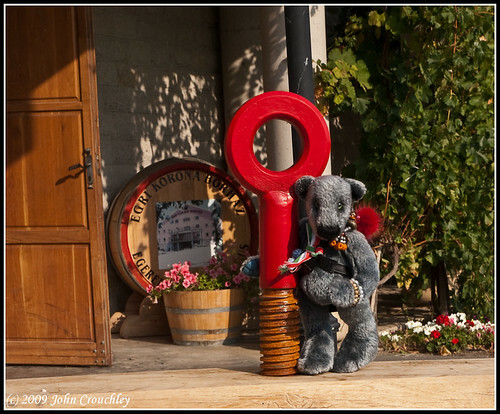 We then visited one of the best wine cellars in the district, to taste and possibly buy. Vines as far as the eye could see. We watched some grapes being picked and looked at the old presses. I think this one is a bit too big for me to manage. This was a bit more my size but still loked like blooming hard work. Still the end result is lovely, Claire and Rob bought a couple of bottles to take back with them and John and Maria are going to call back after dropping the youngsters at the airport on Sunday and buy a couple of cases. 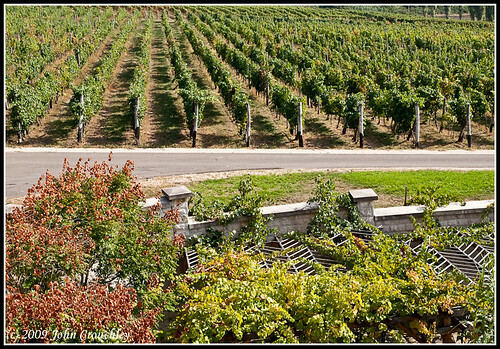 Tomorrow we’re off to another wine growing region, Tokaj. I really am starting to worry about space in the car. This entry was posted on Tuesday, September 22nd, 2009 at 7:24 pm and is filed under Hungary. You can follow any responses to this entry through the RSS 2.0 feed. You can skip to the end and leave a response. Pinging is currently not allowed.